Carcanos constitute a large part of my collection. I have divided the pages up between the M91 and the M38. The M91 took on many different forms. The M91 Rifle (Fucile Modello 91) was adopted in 1892. The cavalry carbine (Moschetto Modello 91 da cavalleria) was adopted in 1893 and was followed in 1897 by the M91 Troop Special (Moschetto Modello prt Truppe Speciali). In 1924 the Italians started cutting down M91 rifles into carbine legnth to get some more use out of old guns. 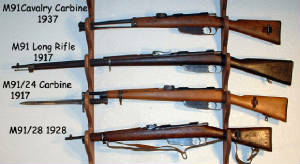 In 1928 a new carbine was designed that looks similar to the M91 T.S. with afew changes. You can tell a M91/28 by the date 1928 - 1938.